The comprehensive hormone panel checks the blood levels of 9 hormones. What is tested in the comprehensive hormone panel? The comprehensive hormone panel measures the cortisol, DHEA, estradiol, estrone, IGF-1, progesterone, prolactin, SHBG and testosterone total and free blood levels. Why is the comprehensive hormone panel important? The comprehensive hormone panel checks a hormones that help evaluate general health, libido, hair and muscle health and fertility. This Comprehensive Hormone Panel is a blood test. The comprehensive hormone panel includes the tests from the advanced hormone panel - DHEA, estradiol, prolactin, SHBG and testosterone total & free. The comprehensive hormone panel also checks the cortisol test, estrone test, IGF-1 test and progesterone test. To get a comprehensive hormone panel near you, simply order online and get tested at the lab that you selected. 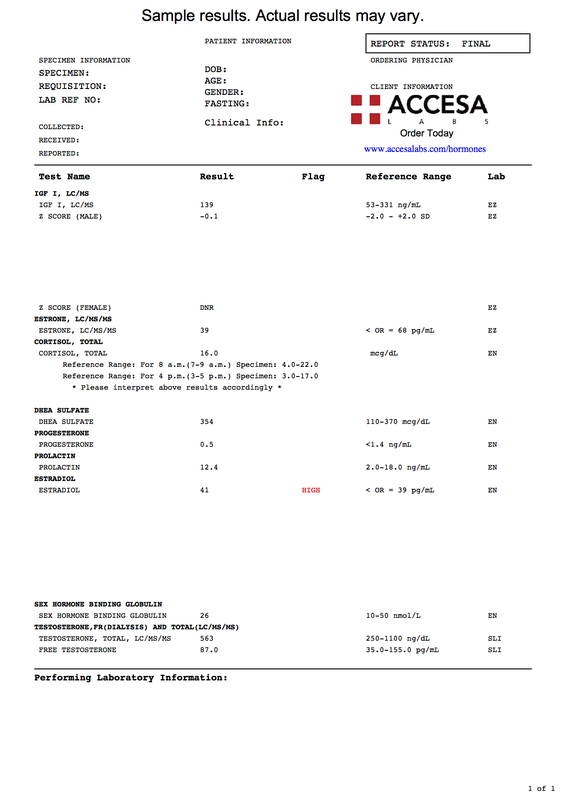 Once your comprehensive hormone panel results are ready, they will be available for download. As can be seen on your comprehensive hormone panel results, the individual tests will be reported as numerical values and can be compared against the reference ranges provided by the lab. If you are looking for a simpler hormone panel, check out the hormone panel test. Comprehensive Hormone Panel at Guaranteed Prices.